Seven, or as it used to be called Channel Seven, is a local community TV station based in North East Lincolnshire. It started out in 1998 and I joined it in that year. I’d left my job as a newspaper reporter to help come in and set up the news operation. For a while I worked on reception, before moving over to set the team up. There was a small team of us – Chris McRae, Rob Dabb, Andrew Redfearn, Tony Whiley (*he went to Sky News), Lee Byatt (*who went to Sky) and Dave Ward, plus volunteers like Stuart Hall and Del, who all went out filming features and producing content for a magazine programme called Scene On Seven plus others. We worked a lot with volunteers too. There were our regular presenters, Michelle Portess and Gary Williams amongst many others including Dave Otter (GTFC Supporters’ Club) who presented a sports slot. It relied on their goodwill to do such a thing. passionately about the channel and its relationship with the community. The programmes included an evening bulletin, News on 7, magazine show Scene on Seven, which went out three times a week, a music programme and a live breakfast show presented daily by Chris. Alongside these shows, other producers made a variety of programmes including a watercolour art show. And then there were the one off specials we produced. These were usually live. I can recall a 24 hour broadcast for some charity in which I interviewed someone in a bath of beans and during the full solar eclipse we did a half hour live show with studio guests and a phone link-up with a member of staff in Cornwall. As well as the volunteers, this was the first time students from the NVQ 4 Broadcast Journalism and NVQ 3 Camera and Edit course based at Grimsby Institute joined us. The station was their base for work experience and what an experience they got. When I left the station in 2000 to have a baby, I ended going to work for the Institute and eventually took over the running of the NVQ programme and came full circle. Students to have graced the doors of the Immingham station include Chris Nundy, Robin Small, Keeley Donovan (who now presents the weather on BBC), Leanne Brown (BBC Look North), Minna Pisto (Finnish TV), Louise Adamou, Claire Muckart, Rowan Campbell, Lisa Crawford (all BBC) and many, many more who went on to great successes thanks to the experience they gained. 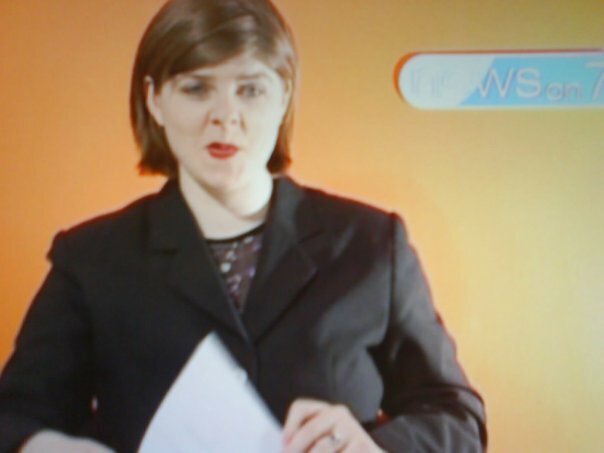 Seven is broadcast on VirginMedia 879 and is the longest running community television station. What made it great is that the people who worked there cared deeply about it. They were local people. The catchphrase was “The place to go to see people you know.” And it was. We had a presence each year at the Carnival and made sure we engaged with communities and covered the news in their area. Let’s hope some more students get the opportunity to produce programmes for it and get the experience needed to get jobs.